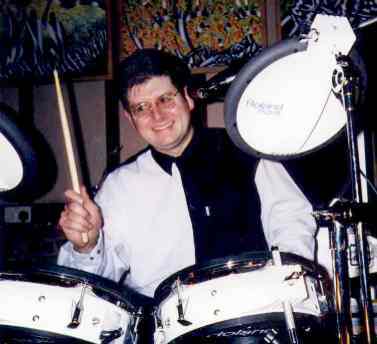 Stuart plays drums and percusion in Jazz Ambience and has a diverse range of instruments of suit all occasions. "Always be prepared" is Stuart's excuse for having three drum kits and a pile of percussion; a fully expanded Roland V-Drum system for recording and large venues, a Pearl Export kit for average sized halls, an Arbiter Flats kit for small venues or background music, and congas/shakers etc for latin gigs. "You can never have enough gear" says Stuart who also plays bass with soul/funk band Groove Tube, runs an audio-video recording studio, and produced this web site through his Sales & Marketing Services business (see http://www.salesandmarketingservices.co.uk). Stuart has also recently released an album with Jazz Ambience bassist Simon Fell and fronted by singer/keyboard player Su Lyn ("Clay Angels" available on Bruces Fingers Record Label).